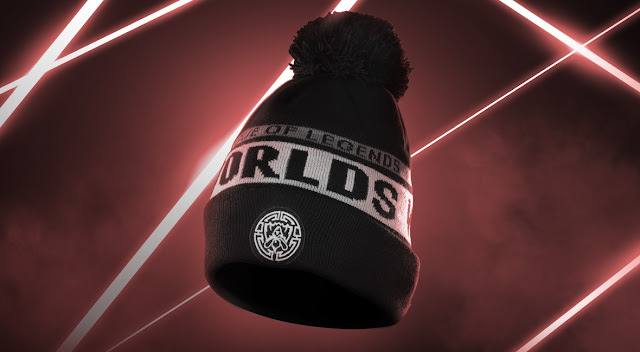 Today's red post collection includes all the details on the Worlds 2017 Missions & Loot, an Origins article on Ahri, the Nine-Tailed Fox, September bundles, a new Ask Riot, Worlds 2017 Merch, and much more! 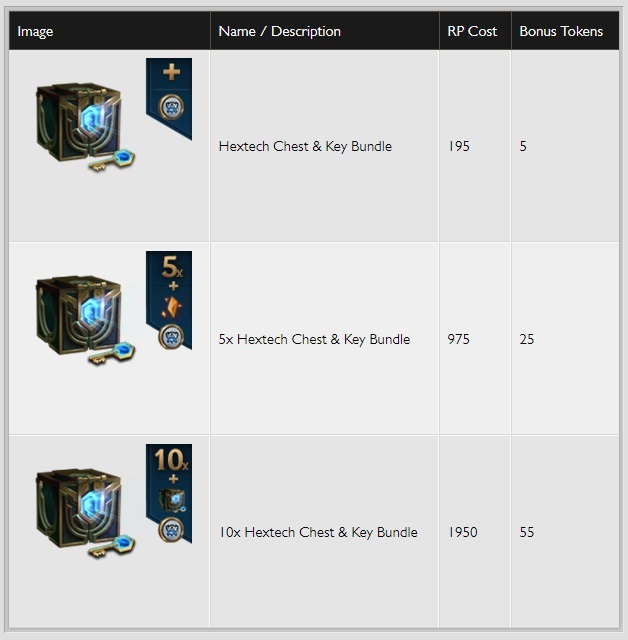 It’s time for September bundles! "The pursuit of mastery requires sacrifice and perseverance. 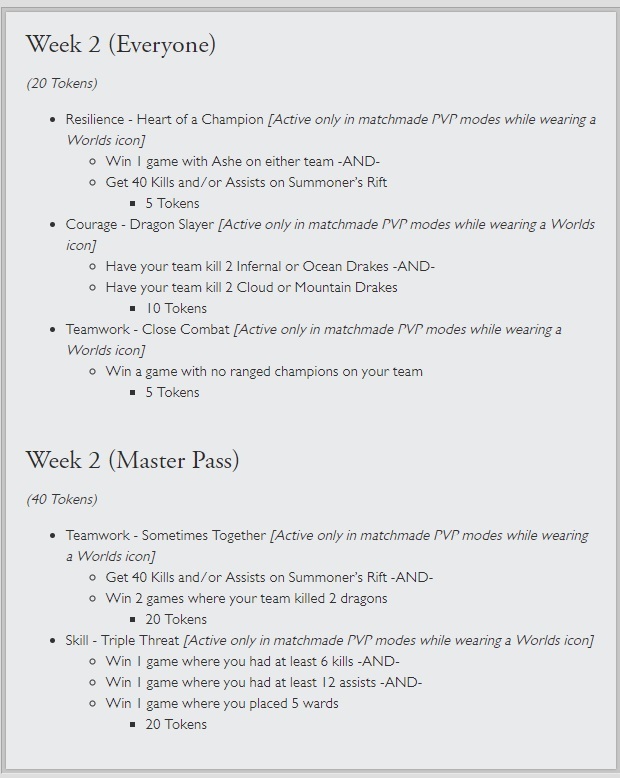 For those of you that want an additional challenge and a chance to earn more rewards, we’re offering you the 2017 Worlds Master Pass. 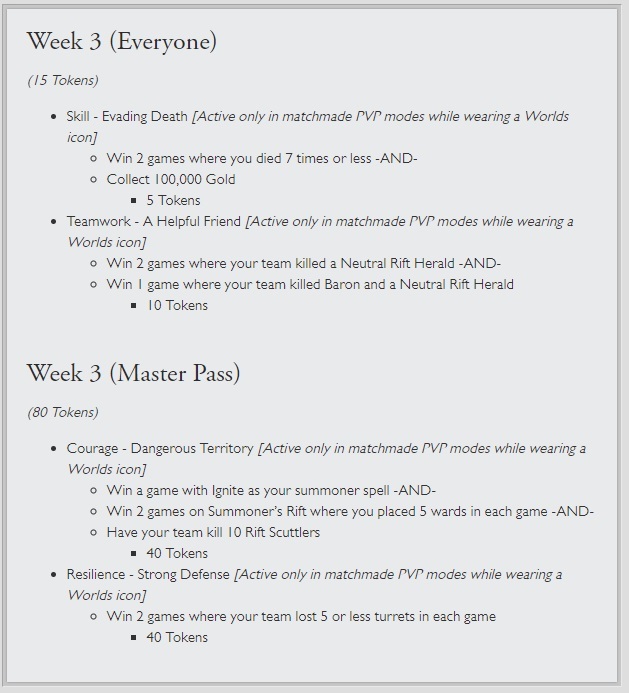 Since the Missions end each week, the price of the Master Pass will decrease over time. 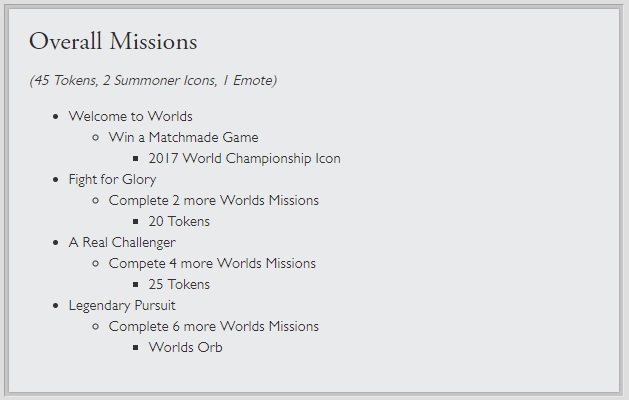 For more information on additional sales and offerings, please go to: Worlds 2017 Hits the Rift"
"Yup, we have a few missions that are pretty experimental. 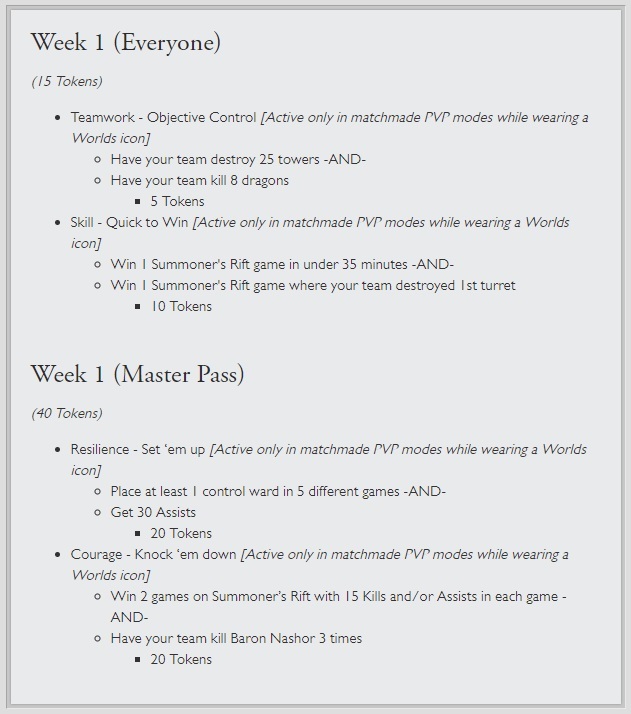 I talked about some of them in a thread earlier this week, but the TL;DR is that the crazier missions require premade so that everyone on the team has to opt in, and are lower reward so that no one should feel too bad about skipping them. We're hoping that these ones can lead to some fun times but definitely want to hear feedback!" From wind samurai to cantankerous yordles, each of League’s 138 champions started somewhere. This is Ahri’s story. 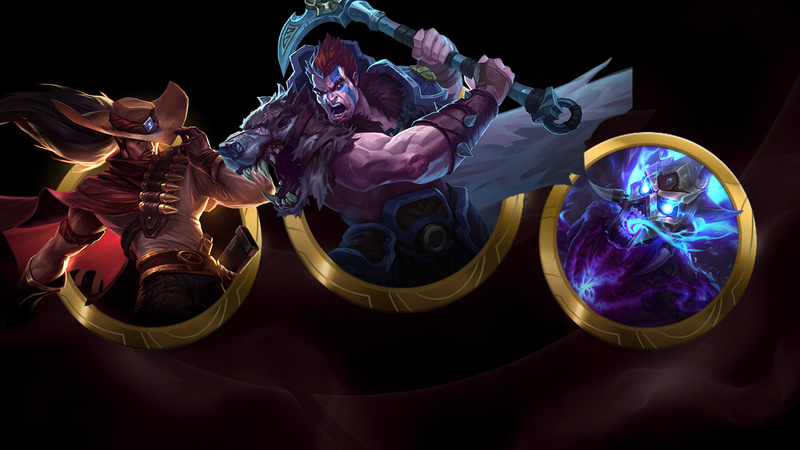 Every champion in League has a unique DNA, and it has nothing to do with biology. In champ design, DNA stands for design (gameplay), narrative (thematic and story), andart (…art). These three elements are the building blocks for every champion, and designers team up to make sure they fit together and elevate each other. Yet it wasn’t always this way. Years ago, it wasn’t uncommon for one of these pillars to lead the charge, with the others being molded around it. 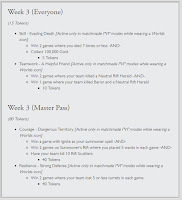 Ahri was one of those champions founded on thematic alone. 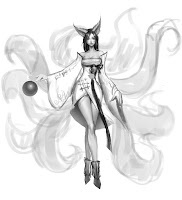 The goal for her was simple: Bring the story of the nine-tailed fox to League. Myths about this cunning creature exist across Asia, and even though there are variations between countries, the core of the tale remains the same. Stories tell of a magical fox who can transform its appearance at will—which usually means it turns into a very attractive woman who uses beauty and charm to lure unsuspecting men to their doom. After killing the poor fools, the nine-tailed fox absorbs their life essence or eats their livers, hearts, or flesh, depending on the version. 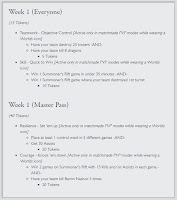 Figuring out how to build Ahri’s character based on these myths was tricky. 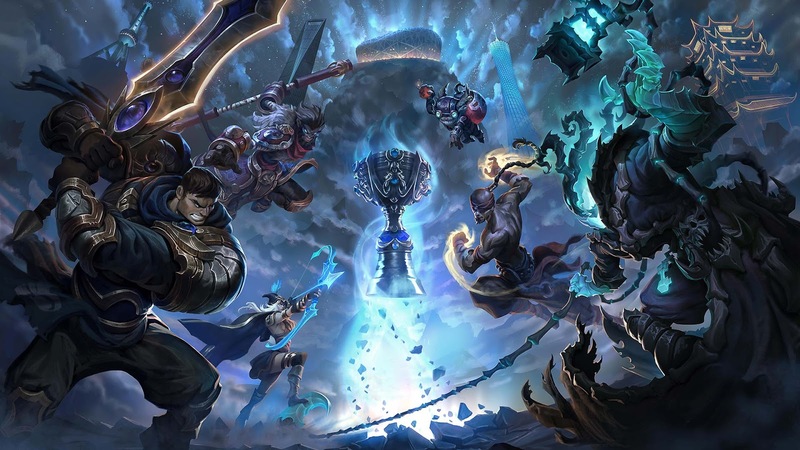 For one, devs didn’t want to just copy-paste an existing story into League. Ahri still needed to feel unique, even if she was based off of real-world myths. Ahri’s story tells of a clever fox who wished to become human. One afternoon, the fox stumbled upon the aftermath of a human battle and was drawn to a man taking his dying breaths. 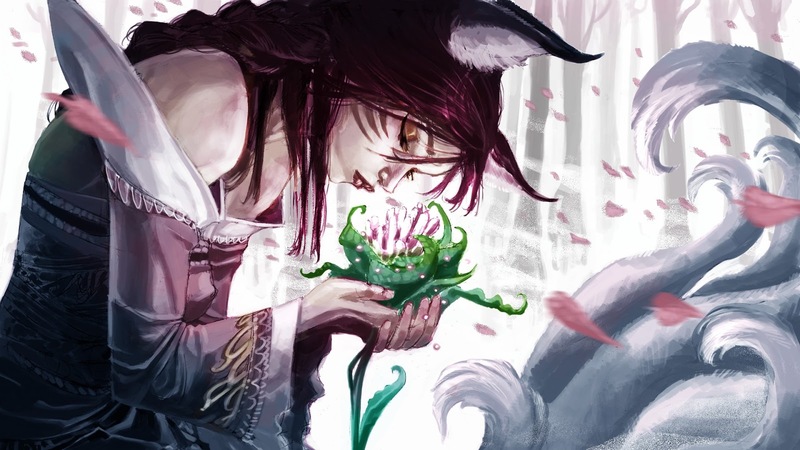 As the essence of life left his lips, Ahri the fox instinctively absorbed it and was partially transformed into a human. She was ridiculously beautiful—and knew the power that it held. Using her charm, she seduced men to their deaths, consuming more and more life essence in an attempt to become fully human. But with her growing humanity came a moral compass, and she soon found herself unable to kill without remorse. This tale gave Ahri a motivation for murder that wasn’t just in cold blood—she was driven by her desire to be human—while still reflecting the gumiho myths she was based on. 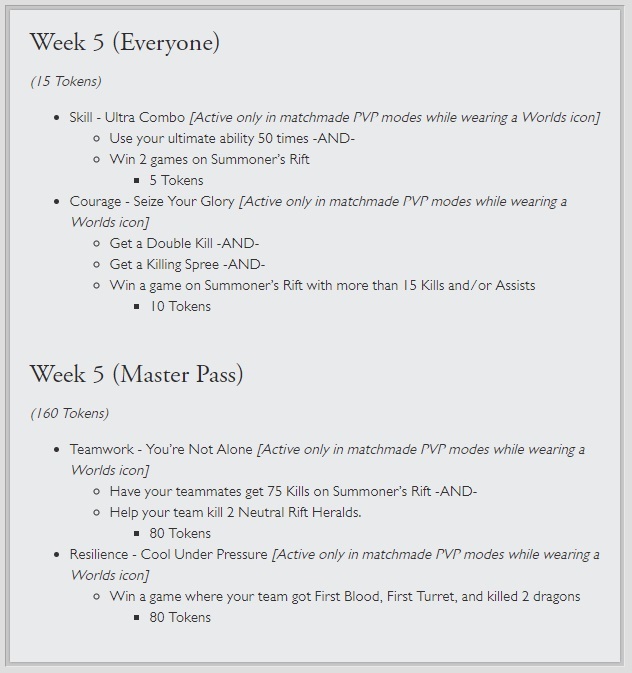 Bonus: Ahri was named by Korean players through a poll on the League of Legends website. She almost could’ve been Nabi, Danbi, Ruri, Dasom, or Chorong, but Ari won out. “Ari” literally means graceful and elegant in Korean, so the “h” was added to give her a more unique name. 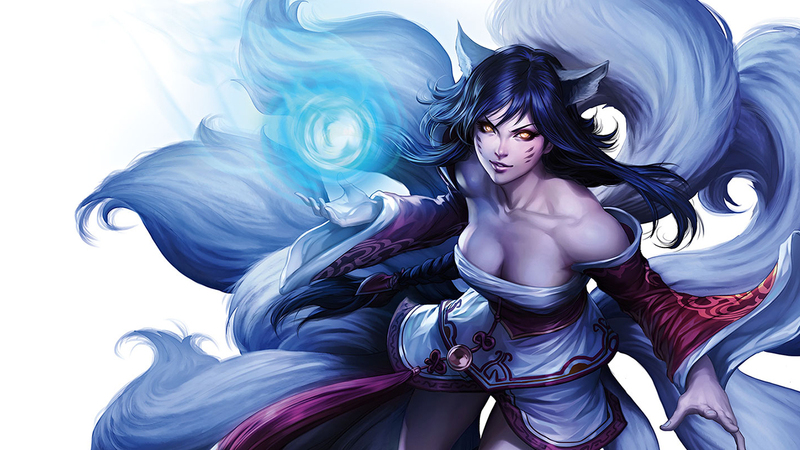 From the start, Ahri’s abilities included an orb, a charm, fox-fire, and some kind of dash. 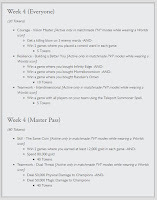 This consistency is far from the norm in champ development, but because most of Ahri’s abilities were directly based on her thematic, nothing drastically changed. Most alterations were subtle and aimed at making her kit feel as satisfying as possible. 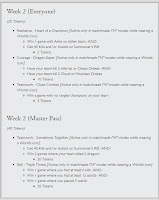 What changed: The speed at which charmed champs walked towards Ahri had to be lowered (by a lot) because she’d just walk the lovestruck dummies directly into her tower. Fox-fire: In some myths, the nine-tailed fox could literally generate fire. 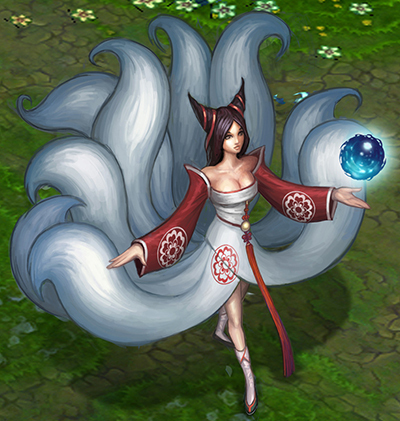 More often, fox-fire was a representation of the spirits they collected, which is what Ahri’s orbiting fox-fire is. 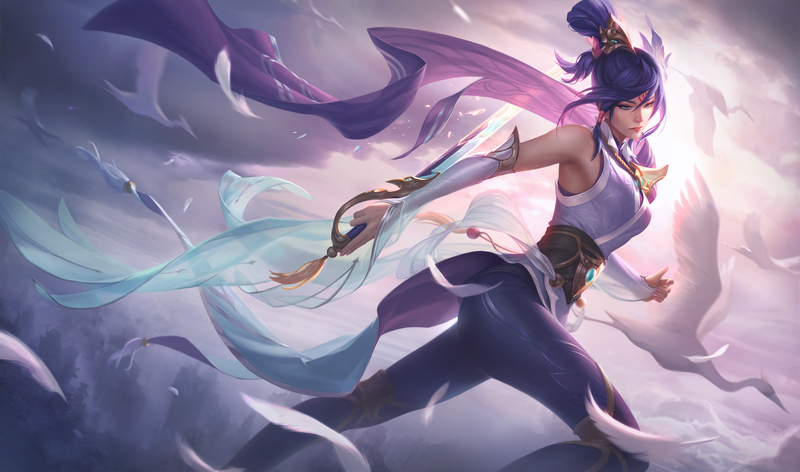 Spirit Rush: Ahri was designed to be an assassin who skirts the edge of the fight looking for opportunities to get in, and a dash helps her get into the fray to make clutch picks. 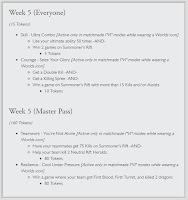 What changed: The original version of Ahri’s ult had an unlimited range. 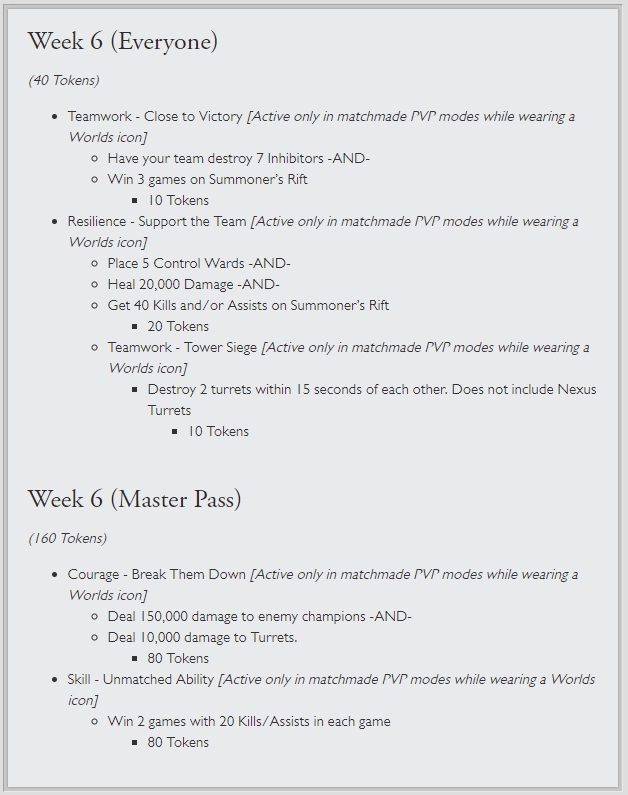 She’d have to continuously spend mana to travel, but if Ahri passed over an enemy champion, she’d do bonkers damage—she basically became an Ezreal ult. “We had to change this ultimate due to its interactions with the Dominion map, which is easily one of my biggest regrets on the character,” says Ezreal. Later, Ahri had a three-part dash (like her live ult) that used an ammo system similar to Akali’s, but she’d almost always save one dash as an oh-shoot-I’m-getting-ganked escape button, and that was no fun. 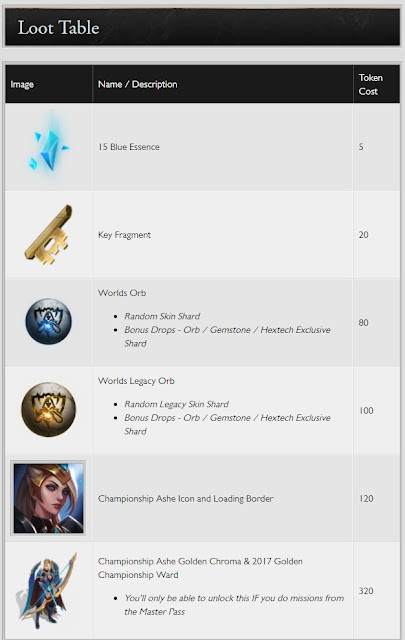 Orb of Deception: Every champion in League should have a clear source of power, which is basically the object or technique they use when fighting. It’s obvious when someone has a bow or sword, but it’s less clear when it’s a weaponless fox lady. “Ahri’s orb was something players could look at, understand, and guess what it does—it’s a ball, so she’ll probably throw it,” says Ezreal. Plus, the orb gave Ahri a way to drain life essence (aka health) from champs in game. 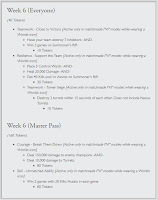 What changed: The orb originally stopped at the end of its path and Ahri could reactivate it to bring it back to her. During playtesting, players reactivated the orb immediately 90+% of the time, so that just became the ability. Her orb also used to travel at a consistent speed throughout its air time, but during a late playtest, Ahri’s kit felt underwhelming. To address this, her ball was changed so it travels outward and backward quickly but hovers briefly at full range, allowing her to reposition for maximum damage. Nine-tailed foxes rely on their beauty to seduce victims, so there was no doubt that Ahri should be a very attractive character. At the time, RiotZeronis was a contractor, which meant he received an overview of Ahri’s character in an email and then set out to draw the fox-like female. 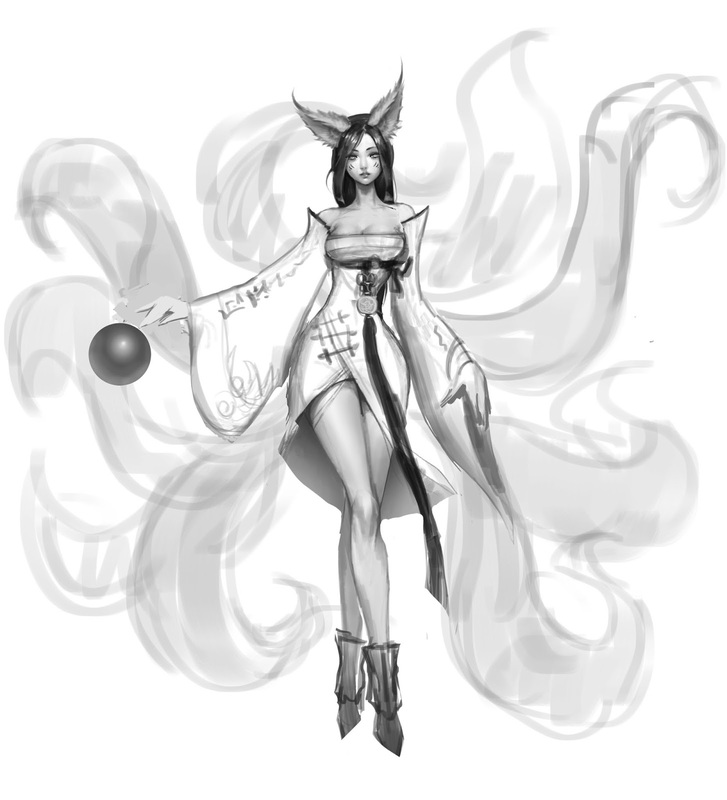 It was a fast sketch because she was moving quickly through development, but it only took one drawing to find the direction for League’s nine-tailed fox. 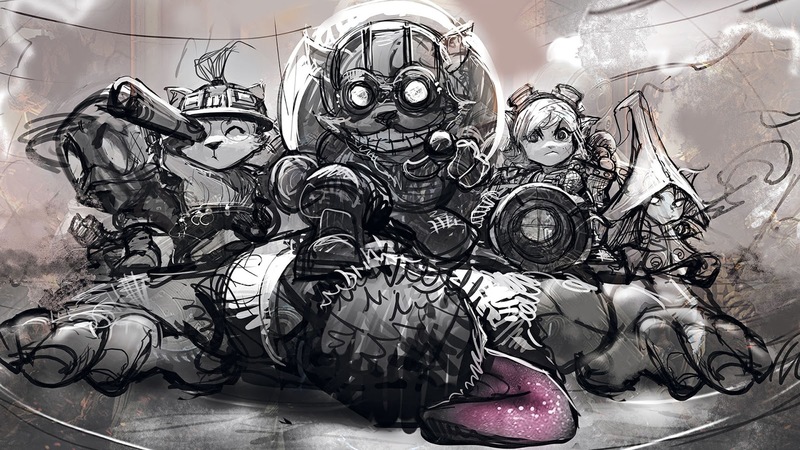 “Of all the champions I’ve worked on, this was most my style,” says RiotZeronis. “She’d be my waifu." 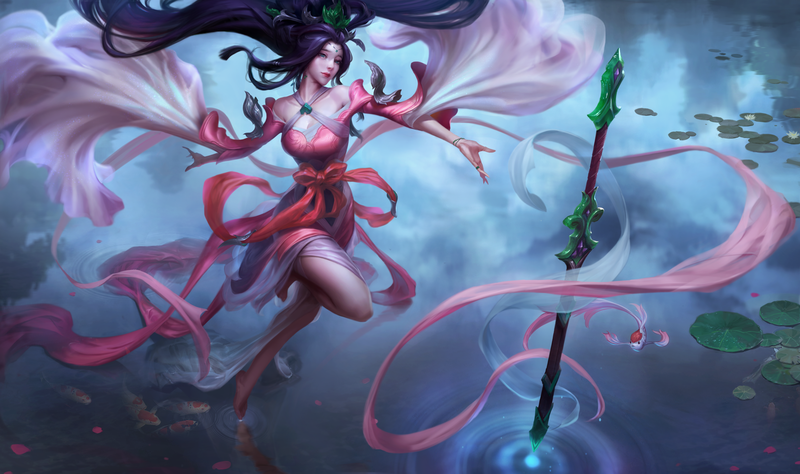 It seems like it would’ve been a straightforward path from there, but Ahri actually had major art changes right before launch, as seen in the original splash released to players. 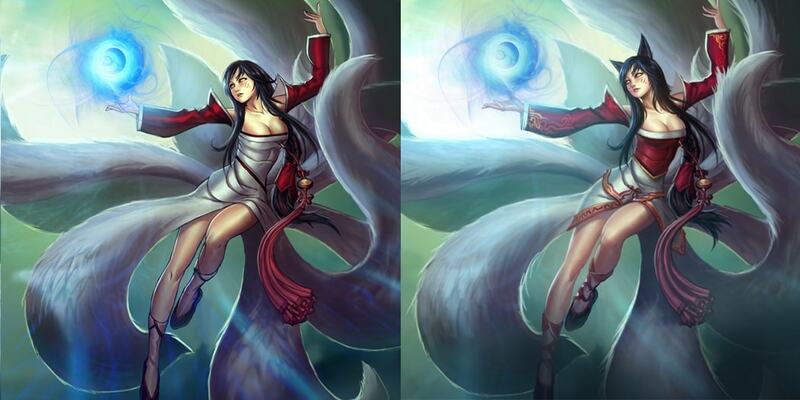 On the left is Ahri’s originally published splash, and on the right is the final, modified version. Notice anything different, like maybe the red lining on her dress or details on her sleeves or the part where SHE ALMOST DIDN’T HAVE EARS?! And those tails aren’t even real—they were a part of her outfit. Part of it was just tech concerns. It was unclear if it’d be possible to make Ahri’s tails connect to her dress in-game in a way that looked natural, so they were redrawn as part of her outfit. Devs eventually found a fix to the tech issues though, so that wasn’t the deciding factor. The main reason Ahri was designed without ears or (real) tails was to try to really differentiate her from the myths she was built on. There was a lot of concern about Ahri as a champion throughout development, and some Rioters were worried she wouldn’t fit into League’s universe or that players wouldn’t get her. This uncertainty led to Ahri losing her most fox-like features, which made her look more like an “average” girl than a legendary nine-tailed fox. Even with the mixed feedback, devs decided to go back to her original design. 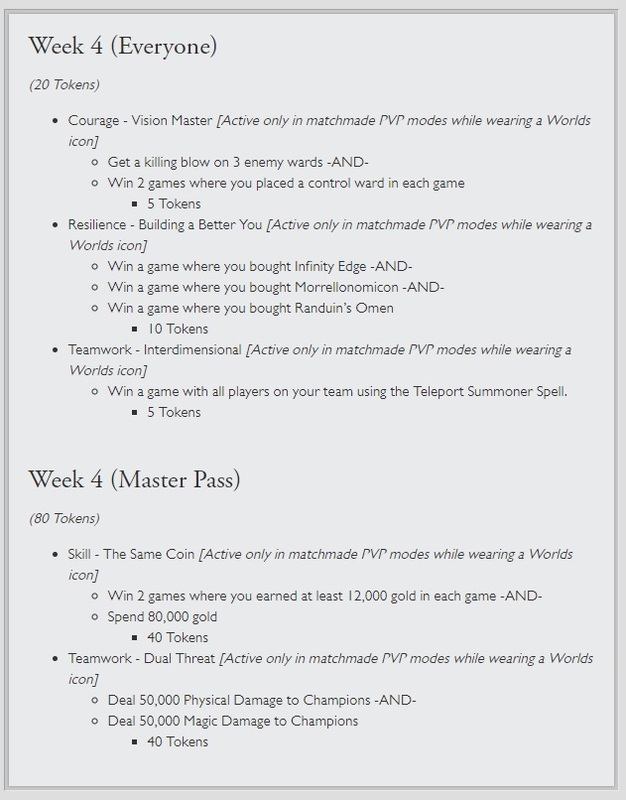 “It’s natural to want to make something unique,” says Ezreal, “but we found we were doing so for the wrong reasons. Ultimately, we believed players would want the true version of the nine-tailed fox more than an artificially unique one.” Ahri’s signature tails and ears returned, and she’s been breaking hearts and taking lives on the Rift ever since." "Grab these limited-time bundles now through 9/28/17 at 23:59 PT. "Let’s talk hiring fallacies, death recap, honor decay, and getting merch into different regions. "The Radiant Wukong Figure comes with a special digital unlock of an exclusive Worlds Radiant Wukong icon. Follow the instructions post checkout to unlock." "Destroy your enemies both in lane and in the fashion game with this limited edition destroyer jacket." 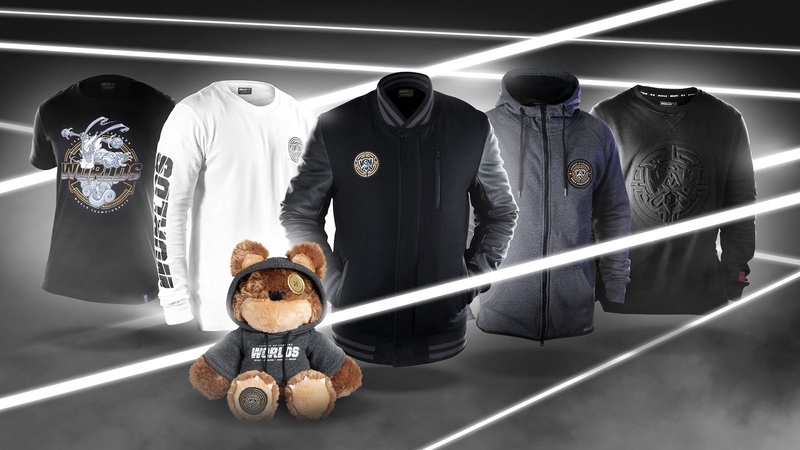 "The premium Worlds Hoodie features a raised scuba-style collar, a two-way front zipper, lengthened back, and custom-designed side panels. 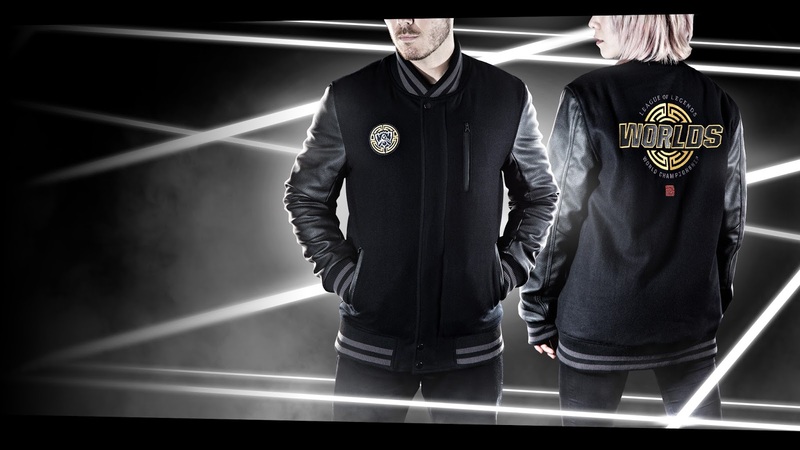 The Worlds crest is micro embroidered on the front and a Worlds design is gel printed on the back." 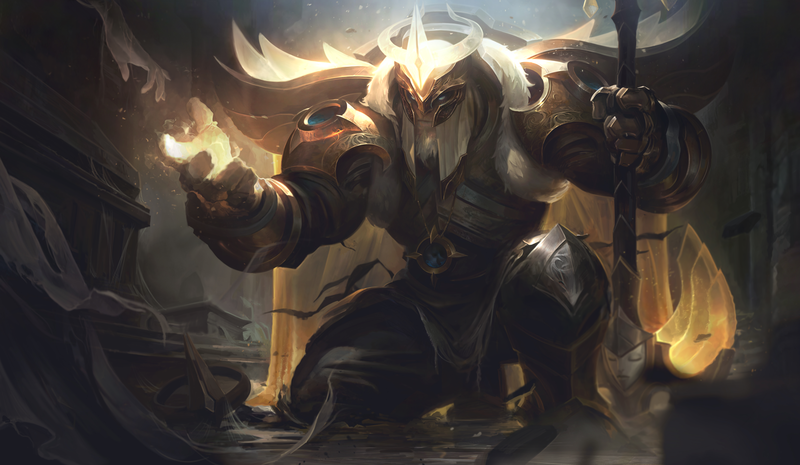 "Radiant Wukong is poised and ready to fight for the honor of Worlds. This is the official tee of Worlds 2017." "This french terry crewneck features an embossed Worlds crest on the front, creating a large, yet subtle raised design. The pullover also has a black-on-black Worlds sleeve gel print, two side zippers, and a small red stylized 2017 embroidered logo on the left cuff." "Featuring the cities of the Worlds 2017 competition tour, this streetwear style long sleeve makes it easy to rep Worlds all year round." "Tibbers got in the Worlds spirit too! Sporting his own Worlds hoodie and exchanging his normal eye button for a gold one, he's ready to cheer on the next champions. Enjoy this limited edition version of Tibbers, made exclusively for Worlds 2017." "Keep your head in the game and in gear." "Accent your apparel with this limited edition pin, made with beautiful hand-filled enamel and metal." 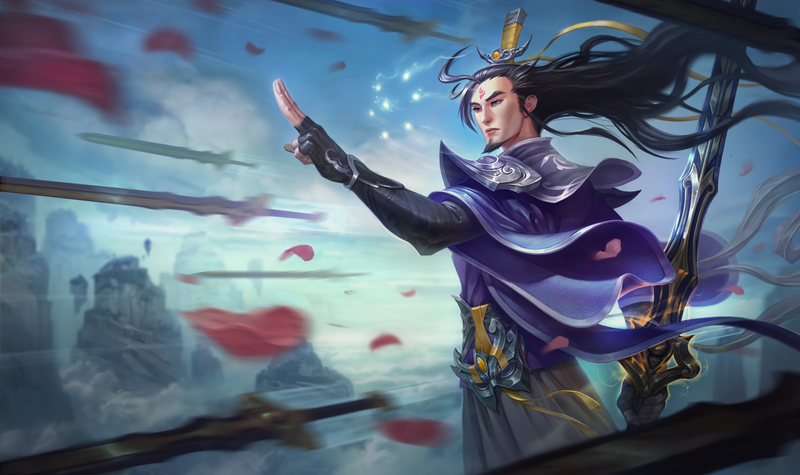 "If anyone wants 1920p splashes for Eternal Sword Yi, Sacred Sword Janna, and Soaring Sword Fiora, I've uploaded em"
 "Hiya cuties! 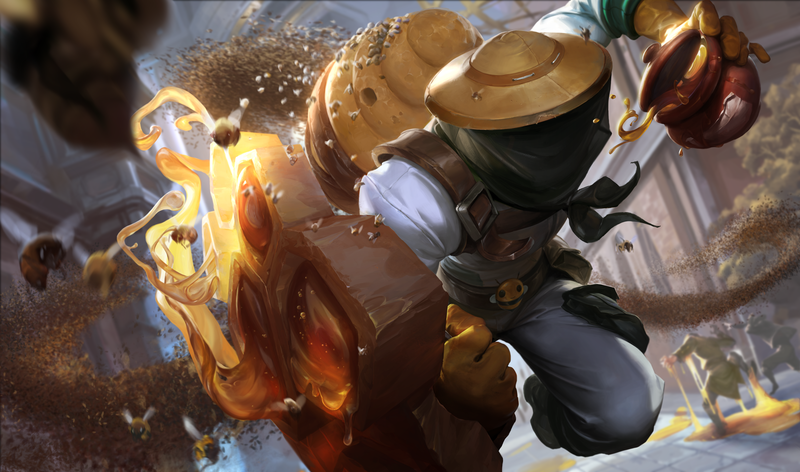 Got some requests for some 1920p versions of the Arclight Yorick & Beekeeper Singed splashes. Try this! http://cubeupload.com/codes/d9b6ca"